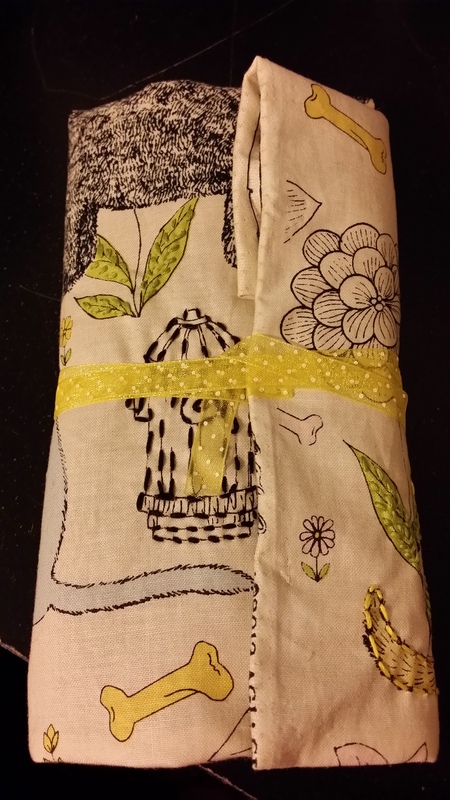 I sew a bit imperfectly and only simple things. I crochet just the basics. I’ve tried knitting and was a comple failure at it. I scrapbook but nothing fancy. And finally, I attempt to sketch in my nature notebook. So what could I possibly attempt next? Embroidery of course. After watching several videos on Youtube, I finally found one that was all I needed. 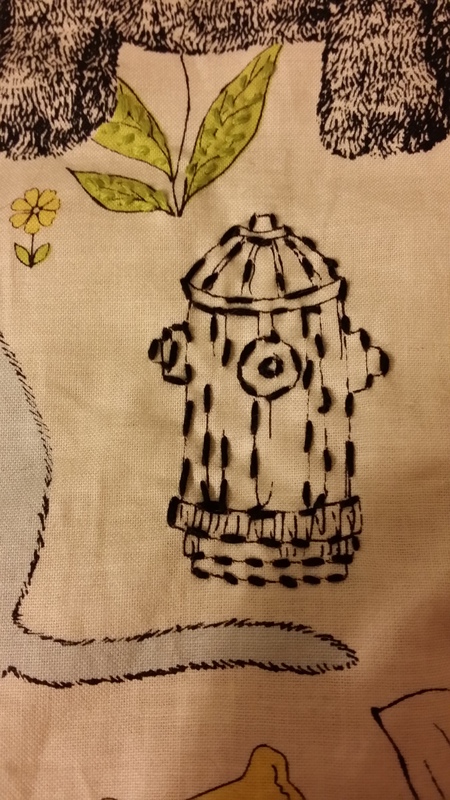 It has a music background and no talking but I think is simple, slow, and clearly shows each stitch . Check it out! 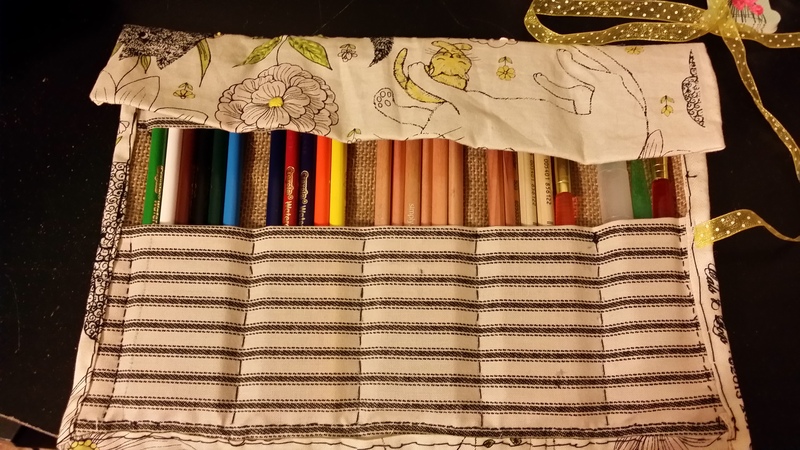 I found myself not wanting another noisy zipper pouch for my watercolor pencils but I didn’t want to leave them in the box either. So I decided to make a pouch that could roll up and fit in my purse or backpack. Now I must confess something. I am a messy crafter. Straight lines hate me. Rulers laugh at me. I don’t follow directions and I’m impatient. Are you scared yet? Let’s start with the inside. I found a large square of burlap in the bandanna section at hobby lobby. I’ve worked with burlap before so finding a square of it already cut and edges sewn was a pleasant surprise. I already had two complimentary fabrics in my stash so I grabbed them and away I went. 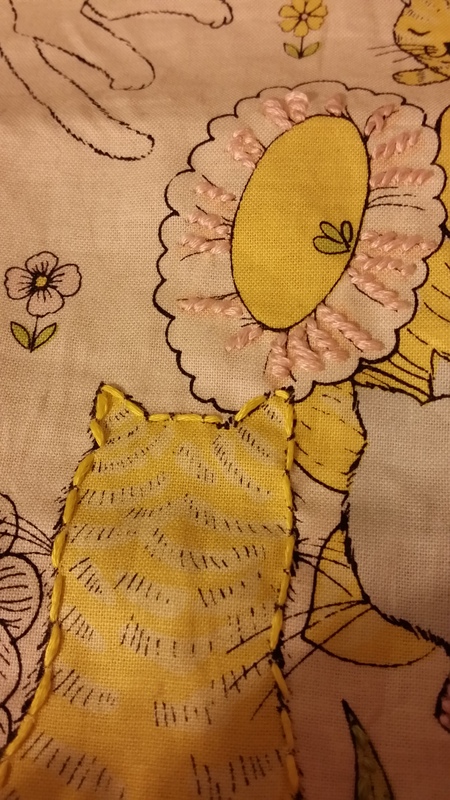 I cut the top fabric first when I decided to try embroidery. Here is a few closeups. I need to work on my tension and keeping the stitches uniform. I am pleased with the outcome. Then the burlap was cut to fit the size of the top fabric. Well, that was the idea. Remember I said straight lines and I don’t get along. So the burlap was not exactly straight. Next up was the striped fabric. I messed around until I got the fabric the height I wanted. The two fabric pieces were stitched together at the bottom to hold it in place. 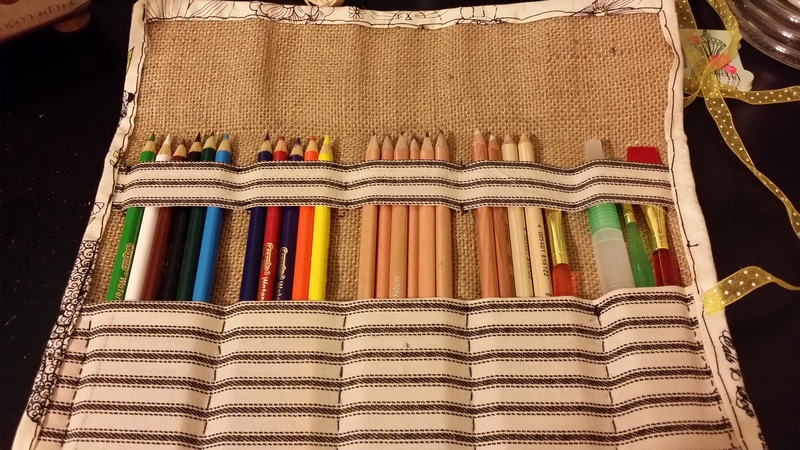 Then I took the ruler and lightly drew the lines I would stitch over for the dividers. A plain straight stitch was all I used for this. I rather like the look of the stitches being between all the color. Luckily I found some nice navy colored thread in the sewing box. Now I came to the difficult part for me- putting it all together. Edges are something I haven’t conquered yet but I toughed it out. Folding and pinning were time consuming. I decided to use the same the same navy thread I used on the stripe fabric. A decision had to be made- did I want to stitch through the layers or find a way to sew through only the inside layers. Liking a challenge, I decided to use only the inside layers. Starting with small stitches didn’t look right to me so I decided to try a stitch I saw on the Youtube video. I used a back stitch (I think anyway). You can tell I’m not a great sewer but the effect is nice. Turning and sewing the corners was the hardest. 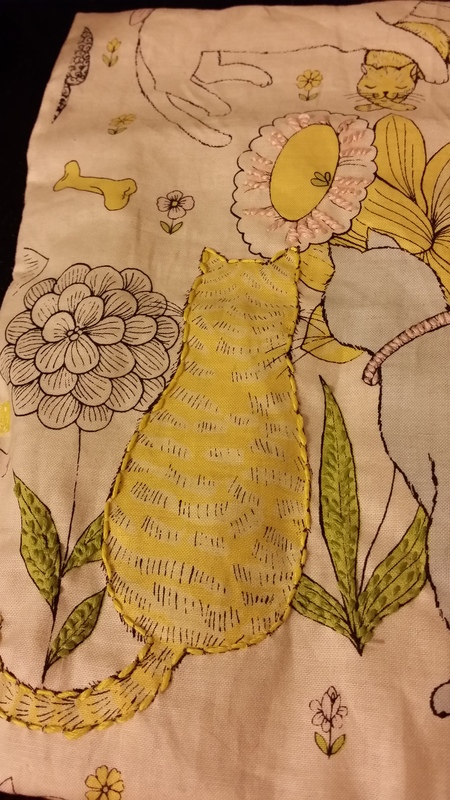 This stitch will get used a lot I think. Here is the finished product. I forgot I decided to add a top strap to help hold in the items. I decided to fold the top over to help hold the items in and because it looks good. 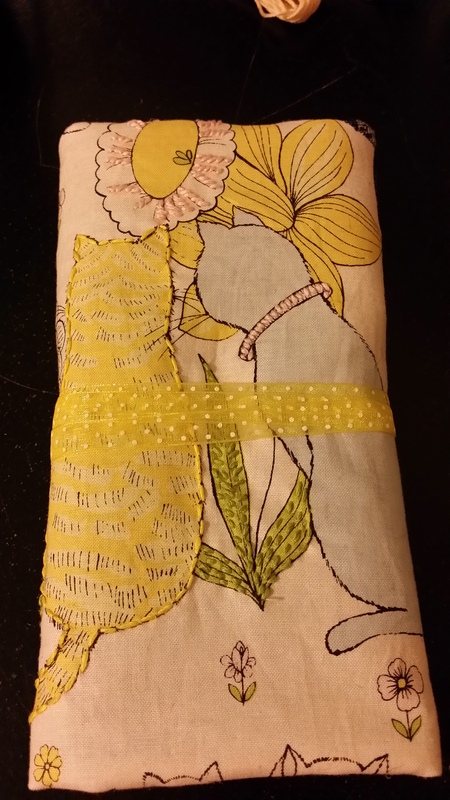 To hold the roll together I used a yellow dotted ribbon sewn to one edge and then wrapped and tucked into itself after being rolled. Overall, I am pleased with the outcome. I will be making several more and hopefully can fix some of my issues to produce a more finished product. So don’t be afraid to try something. Don’t let perfection keep you from being creative. I had fun and that means alot.